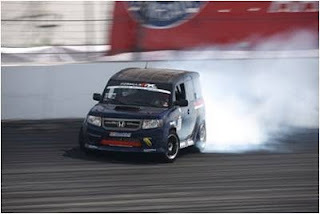 The Toyota Speedway in Irwindale is known as the "House of Drift." 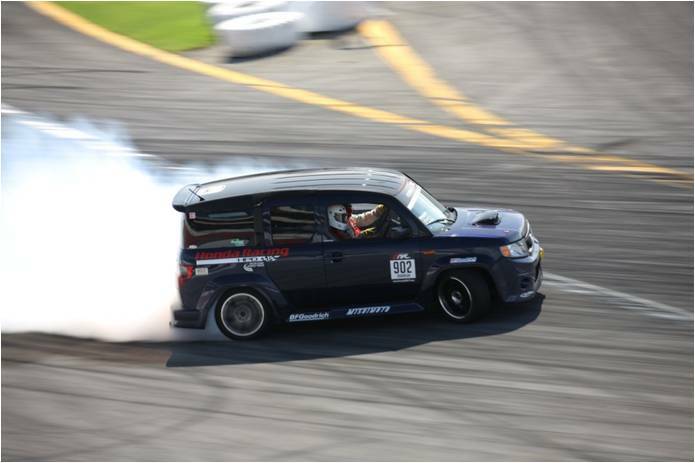 This legendary venue gave U.S. drifting its roots and is often referred to as the "birthplace" of American drifting. This is the home track for most of the pro drivers, and each year the competition grows more intense. The course is both challenging and exciting, utilizing part of the short oval and numerous inside turns which require lots of speed and lots of power!" Thanks to many of the lessons we learned from Round 5 in Las Vegas, we were prepared to take on the big speedway track," stated Robinson, "We had no problems from the Element-D and were looking strong for qualifying." Qualifying took place on Friday, Oct. 8, and the course was packed with more than 40 of Formula-D's most experienced drifters. Facing an uphill battle, the Element headed into its two qualifying runs. The first run yielded a score of 40, which would place the rookie team at the bottom of the board, but the second run brought a strong score of 62.1. After all the drivers made their passes, the THR team received the news: Qualified 33rd! Although missing the top 32 by just 0.1 points, this marked the rookie team’s highest finish, and provided an excellent way to wrap up the season. Always upbeat, James stated: "Although we weren't able to qualify among the top 32, we are still very excited about the Formula-D series, and are already making plans for a truly competitive Honda vehicle in 2011." Although the 2010 Formula-D season is finished, plans are under way for 2011. Stay tuned to the HPD blog to see future updates regarding the buildup to Round 1 in Long Beach, in April 2011! Team Honda Research and Team Honda Research-West ended their sprint racing season with a successful weekend at the 2010 NASA National Championships held at Miller Motorsports Park in Tooele, Utah. 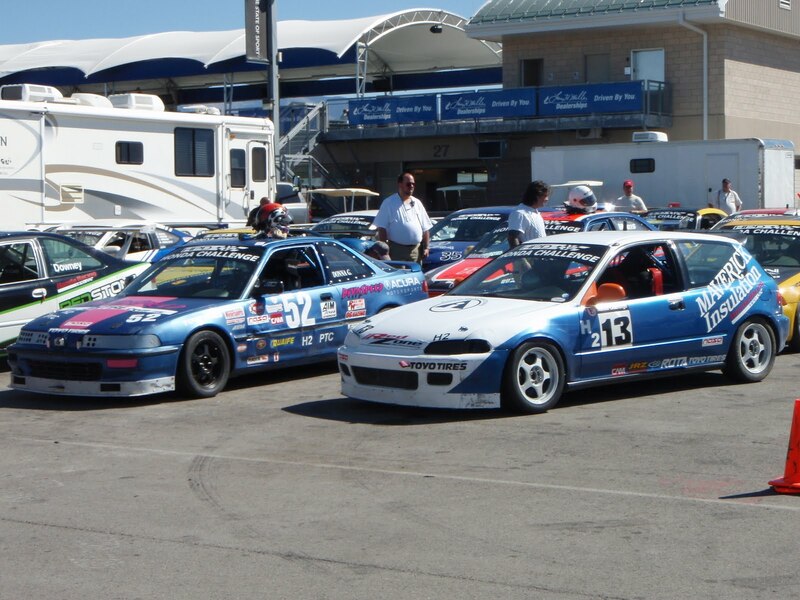 Drivers Lawrence Hwang and Brian Shanfeld had high expectations even though this was the first competitive event for either driver at the challenging 3.0-mile Outer Course at Miller Motorsports Park. Lawrence competed in the Honda Challenge 1 class in his THR-W RSX Type S. Brian and his BFGoodrich-sponsored 2007 TL Type S also competed in the Honda Challenge 1 class, as well as in Performance Touring B. Honda Challenge is a set of 5 class races exclusively for modified Honda and Acura cars. The Performance Touring category is a NASA class created using a versatile points system to allow nearly any production car to compete with a wide variety of allowed modifications. The extended race weekend began with clear skies and high temperatures in the 70s. The NASA National Championships started on Thursday, September 16, with Qualifying Race #1 for the Honda Challenge class. After a good morning qualifying session that placed him third on the grid, Shanfeld struggled in the race with unpredictable handling and finished a disappointing sixth. Hwang, however, had a strong race, moving up to finish fourth After switching to the faster BFGoodrich R1 tires and making a few setup improvements, Shanfeld had a much better result in Performance Touring Qualifying Race #1. 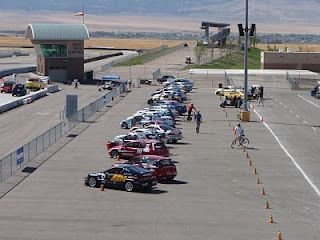 Starting from the outisde of the second row, he was able to chase down the pole-sitting Mini Cooper S and take the win. In the process, he set the fastest race lap in the class for the weekend at 2:11.8. 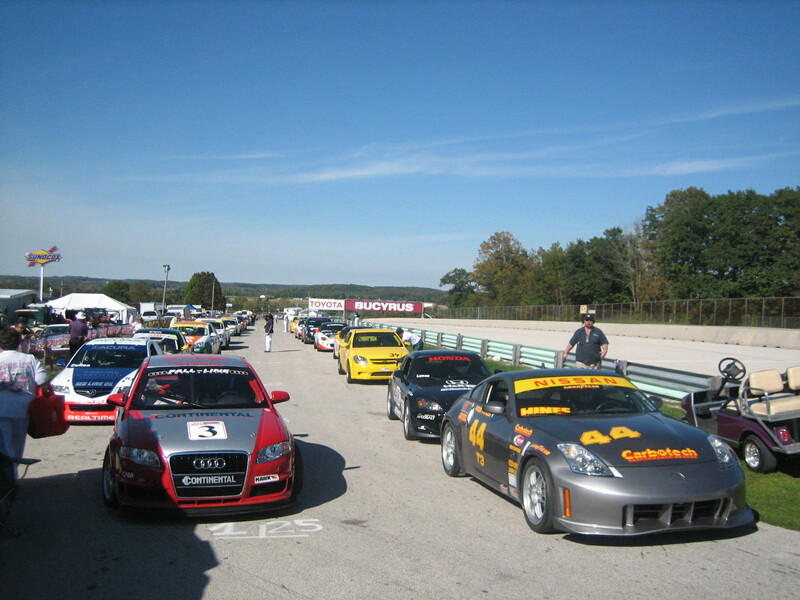 On Friday, September 17, the format repeated itself with Qualifying Race #2 for each class. The morning didn’t start off well in the Honda Challenge class, as neither Brian nor Lawrence had good qualifying results. Brian’s session ended after only three laps with a broken upper ball joint, sending him to the paddock early. Lawrence ran out of fuel after one clean lap. However, both drivers were able to improve during the race, finishing fourth and fifth, respectively. In the Performance Touring race, Brian wasn’t able to repeat his excellent result from Thursday, and instead finished a distant fifth. With the qualifying races complete, the starting positions were set for Saturday and Sunday’s championship races. Lawrence would be starting third and Brian fifth in Honda Challenge 1 race on Saturday. In Sunday’s Performance Touring race, Brian would be on the outside of the front row. The weekend weather continued to be dry, but temperatures had climbed into the 80s and the wind had picked up considerably on the flat and dusty Miller Motorsports Park. After a great standing start in the Honda Challenge race, Brian was able to move from his starting position to challenge for the lead through the first sequence of corners. In the end however, he wasn’t able to match the pace of the two leaders and fell back to fourth. After series of battles with the TSX of Andre Hartanto, Brian was able to regain third position and captured the final spot on the podium. Lawrence was late to the pre-grid and had to start from the pit lane after the entire field had passed by. 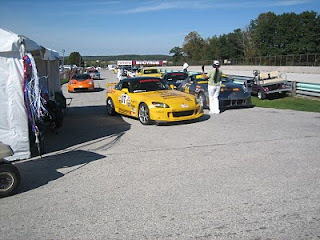 A crashed-out S2000 led to a damaged splitter on the RSX, but the yellow flag also helped Lawrence catch up to the pack. He was then able to filter through the field and squeeze by the RSX of Kris McCoy by Lap 14. 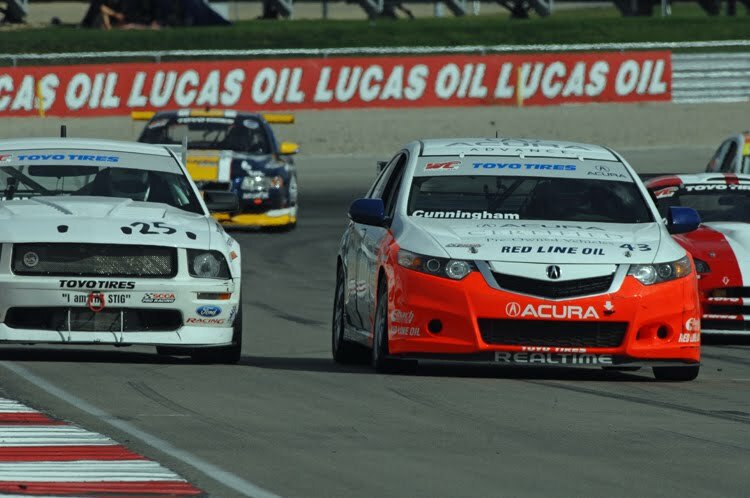 At the end of the front straightaway on the final lap, Lawrence had the nose of the RSX on the rear bumper of the TSX ahead of him, but he ran out of time to further advance and settled for fifth. In Sunday’s Performance Touring race, Brian charged to the lead from his starting position on the outside of the front row and never looked back. By the end of the first lap, his gap on the field was more than 5 seconds. 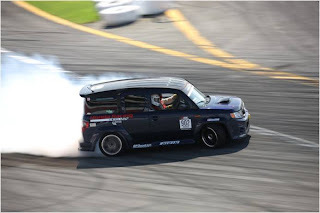 Brian was able to keep up the fast pace due to the always-consistent BFGoodrich R1 tires and cruised to the victory over a Performance Touring B field that included such diverse vehicles as a Ford Mustang, Chevrolet Camaro, Mini Cooper S, and Mazda RX8. Team Honda Research thanks Honda Performance Development for its ever-increasing support of grassroots motorsports and BFGoodrich for supplying fast, consistent, and easy-to-drive R1 tires. The final round of the 12-race 2010 World Challenge Championship was held at Miller Motorsports Park, in Tooele, Utah, just west of Salt Lake City. Peter Cunningham secured his 10th pole position of the year and his eighth GTS category victory, but it wasn’t quite as simple as that. Cunningham, who had already locked up the inaugural GTS Drivers’ Championship, and RealTime Acura teammate Nick Esayian, who had already clinched the second spot in the points, knew the outcome of this race wouldn’t affect either’s year-end status, so they were racing for pride and the ‘W’. The matching Acura TSXs lined up first and fourth, but after the standing start drag race down the long front straightaway to Turn 1, a swarm of rear-wheel-drive GTS competitors drove past, knocking them back to sixth and ninth. Cunningham worked his way back through the field to third by the end of the first lap. 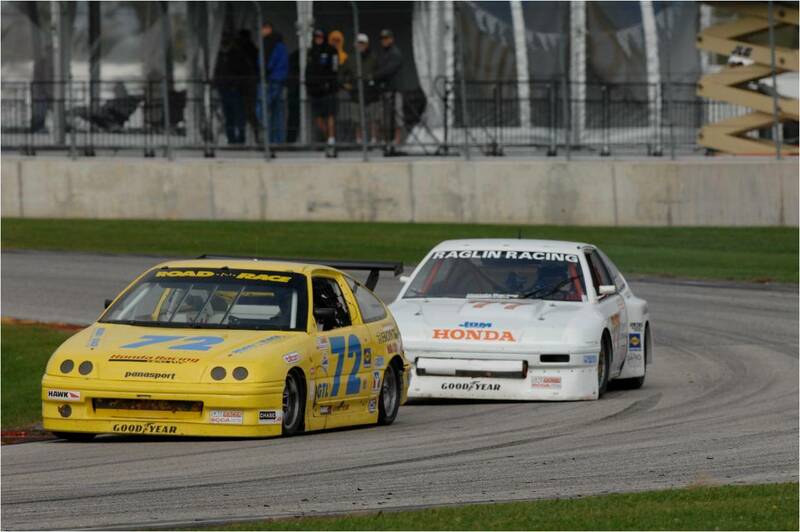 But as he and Ernie Jakobowski’s Porsche Cayman were battling for position, the Corvette of Kyle Kelley drafted past as they crossed the starting line to begin Lap 2 of the 21-lap sprint around the 3.08-mile perimeter circuit. After dispatching the Porsche, the Acura gave chase to the Corvette and on Lap 6 found its way by. 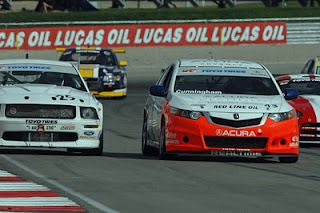 Now up to second place, Cunningham began to reel in the leader, 17-year-old Ben Crosland, in a Ford Mustang FR500S. By the 13th lap, the TSX was pressuring the Mustang and finally found an open door approaching the final corner. The two raced side-by-side cleanly onto the front straight and Cunningham was able to keep the lead and edge away from there. Meanwhile, Esayian was filtering through the pack in similar fashion, moving up to fifth by Lap 5 and to fourth on Lap 7. As the race ran caution-free, Nick did his best to catch the third place Mustang of George Winkler. With a lap to go he had him in sights but ran out of time, missing the podium for only the third time in 2010. On the strength of the two RealTime cars scoring 10 poles and 19 top-three finishes throughout the year, Acura collects its ninth World Challenge Manufacturers’ Championship, breaking the tie with Porsche, which owns eight. Catch all the action from the Miller race in a two hour special on VERSUS, October 30th at 3:00p Eastern. The RealTime Racing team is sponsored by Acura Motorsports, Acura Certified Pre-Owned Vehicles, Red Line Oil, Eibach Springs, Sparco, Hawk Performance, Brembo, A-SPEC, BOSCH, and Total Auto Body. 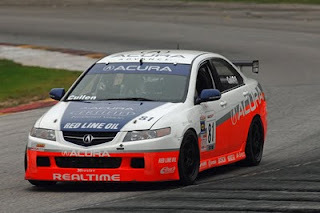 Richard Cullen, in his debut with RealTime Racing, drove an Acura TSX to victory in the SCCA National Championship Runoffs at Road America. 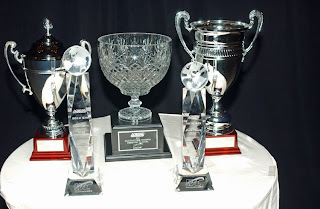 It was the inaugural year for the STU category, the newest of 28 National classes which crowned a 2010 Champion this past weekend at the Elkhart Lake, Wisconsin road racing circuit. Cullen, an energy-efficient home builder from Marshfield, Massachusetts, qualified for the Runoffs by competing in four National races in a different vehicle earlier in the year, with the intention of securing a seat in a more competitive package for this winner-take-all shootout that determines the National Champion. In dicey conditions with a light drizzle falling, Cullen started the 13-lap event from the outside of the front row. Polesitter Joel Weinberger, in a turbocharged Audi Quattro, missed a gear at the start and fell back to fifth, but within a few laps, he had caught back up to the leading Acura. The Audi took the lead on lap four and seemed to be able to inch away for a time. But as lapped traffic on the scenic four-mile track began to affect the new leader, and as the track surface began to dry, Cullen’s Acura was able to mount a charge. 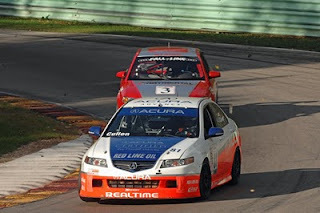 On the long straight preceding turn five, the Acura had the run in the slipstream of the Audi and Cullen was able to pull off the winning pass under braking at the famous turn five in front of a cheering crowd. The Acura held off the Audi’s advances for the final few laps and took the checker by a scant 0.417 seconds. 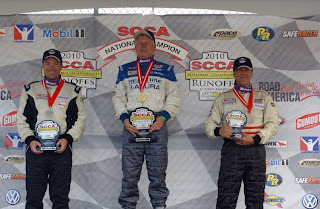 It was 56 year old Cullen’s fourth career Runoffs attempt and his first National Championship title. 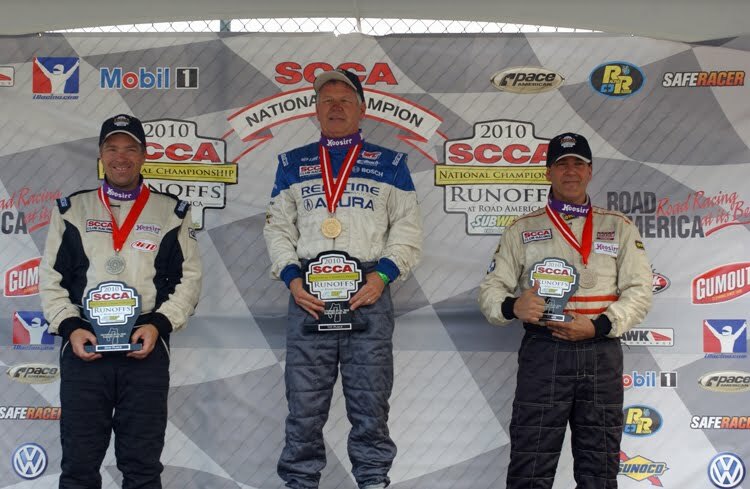 Team Honda Research and Team Honda Research-West successfully concluded their pursuit of 2010 SCCA national championship titles last week with first, second and third place finishes at the SCCA Runoffs held at Road America Raceway in Elkhart Lake, Wisconsin. 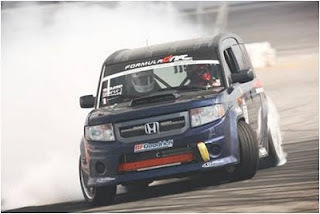 Starting from outside the front row, Chad Gilsinger claimed the T3 class checkered flag and his first national championship in his Honda Racing/HPD BFGoodrich Honda S2000, earning a race track record in the process. 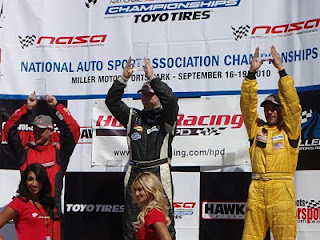 Pole-sitter Sage Marie secured the final step of the T3 podium finishing third in his Honda Racing/HPD BFGoodrich Honda S2000, while Jeremy Lucas finished a solid seventh despite it being his first trip to the daunting 4.0 mile Road America circuit. 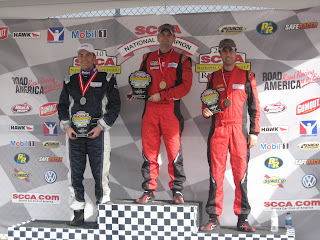 In SSB the 2008 National Champion, Lee Niffenegger, piloted his Honda Racing/HPD BFGoodrich Honda Civic Si from third on the grid to a second place finish. SSB pole-sitter Matthew Staal’s race ended after an encounter with a gravel trap, but not before he managed to set the fastest lap of the race and a new track record. Marie set the fastest T3 lap time of the week in the first of three qualifying sessions with a 2:34.706 for a new qualifying lap record. Gilsinger suffered a flat tire in the first qualifying session, but set the fastest time in the subsequent two sessions to start the race second. Staal set the fastest SSB qualifying time with a 2:42.578 in the second qualifying session. Niffenegger set the fast time early in Q2, but the times got faster as the session went on, and he failed to return to the track in time to defend his position. The start of the T3 race was marked by cool temperatures, high winds, a damp track and raindrops on windshields at various points on the track, making for treacherous conditions. Gilsinger got a slight jump on Marie at the start, but both Hondas were swallowed up by the higher horsepower Nissan an d Chevy that started on the second row. Gilsinger slid through the wet first turn at 45 degrees forcing Marie to check up in order to avoid collecting him. Gilsinger and Marie were able to work their way back to first and second, respectively, before interference from a slow STU class car interfered with the battle for second and killed Marie’s momentum. While enjoying better conditions, the SSB race began much the same way as T3 with the higher horsepower BMWs and Fords getting the best of the Hondas of Staal and Niffenegger at the start. Staal was involved in a heated three-way battle for first when an unsuccessful late-braking passing attempt put him in a grave trap. Niffenegger never lost sight of the leaders and made a last-second pass for third as the checkered flag fell. The second place finishing Mustang was ultimately disqualified for various rules infractions yielding the position to Niffenegger. 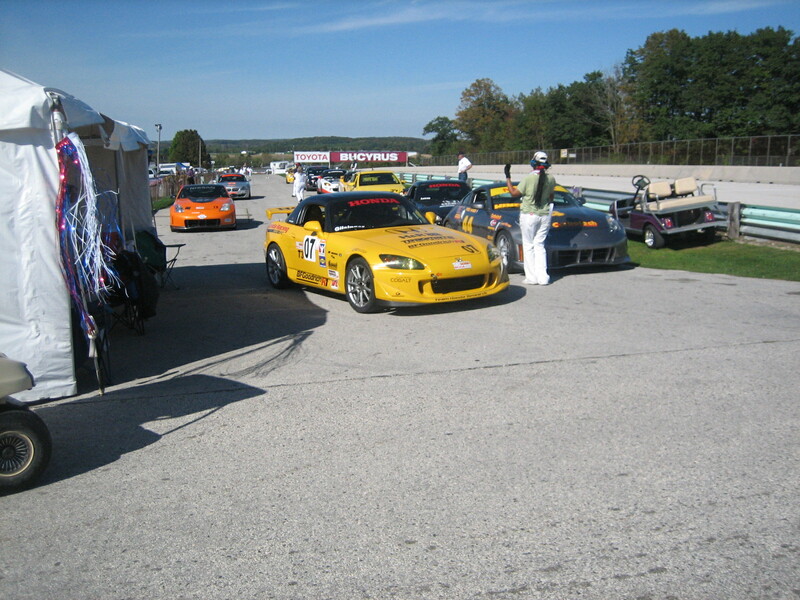 A total of 38 entries in 11 classes sported Honda Racing/HPD livery at the 2010 Sports Car Club of America National Championship Runoffs, September 25-27 at Elkhart Lake, Wis. That marked an increase of six entries and five classes from the 2009 event. In a race combined with the new STU class, both Hondas lost ground at the start to the bigger-engined Chevy Cobalts and Nissan Zs, but in terms of overall lap times the S2000s were quicker. Chad Gilsinger chased down Kevin Fandozzi (Chevy Cobalt) and passed him in traffic. Sage Marie dropped to fifth in the opening lap, but then moved up to finish third. In the third THR entry, Jeremy Lucas started eighth and finished seventh. Tommy Boileau (son of 2009 T3 National Champion Bob Boileau) finished 11th in his first runoffs). 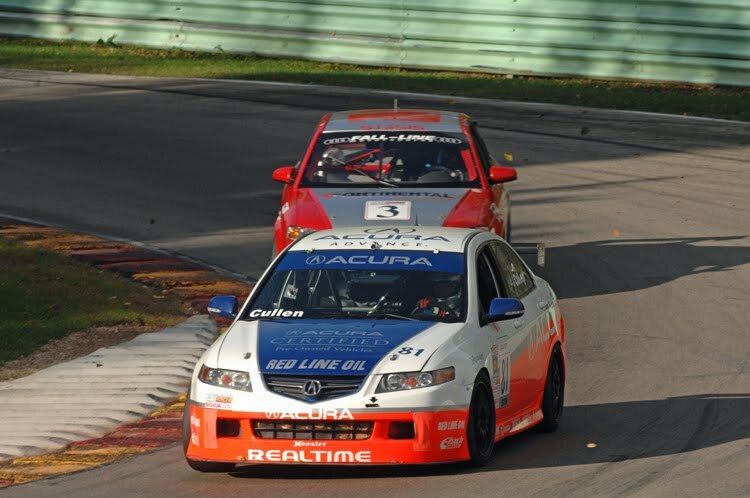 In the same race as T3, Richard Cullen drove an ex-SCCA World Challenge Acura TSX to victory after a race-long duel with the Audi A4 of Joel Weinberger. 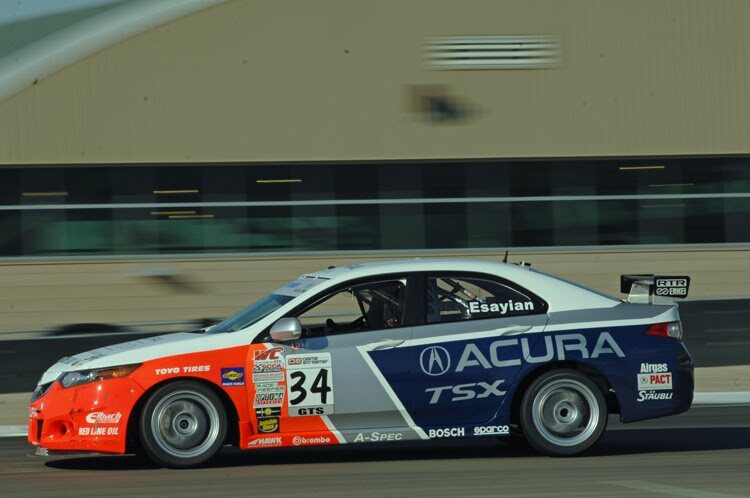 Like RealTime, the Acura was prepared and run by a professional race shop – Fall Line Racing. Mead and Ginsberg started at the rear of the field, but moved up to 10th and 11th, respectively. Amy dropped out after five laps and was a DNF. Pending upcoming rule adjustments, Honda continues to own the GT-Lite class. S hadowen started from the pole and held off a strong challenge from defending class champion Dentici (they went side-by-side through the kink on the final lap!) for the win. Hargrove ran a competitive fifth in his first-generation Civic; Clark recovered from an early off-course excursion to finish seventh. Former class champion Bovis started second, but pitted early with overheating due to leaves blocking the grill, then retired one lap later as the problem continued. An entertaining, competitive race, featuring the second-largest Production/GT/ST field of the weekend. Ruck started third and took over at the front when the Triumph Spitfire of Steve Sargis had a mechanical failure. He then held off several quick Mazda MX-5 Miatas for the victory. Engelke started at the back of the 28-car field, but finished 12th. Smith dropped out with just two laps remaining but was credited with 18th. Niffenegger finished third on the track, but was moved up to second after the runner-up Ford Mustang was disqualified for illegal exhaust modification. Early in the race, pole qualifier Staal battled hard with both Stewart and eventual race winner Ed Zabinski (Ford Mustang), but went off course in Turn 5 while attempting a pass for the lead on Lap 4 and rolled in the gravel trap to end his race. After a heavy crash in qualifying Beede finished fifth in his Bill Fenton entry, with Nakato seventh and Crawford eighth for the Honda RaceLabz team. Former champion Lipperini gave it his best shot, but was unable to match the pace of Mark McCaughey’s winning Toyota Celica. Teammate Crawford started fifth, but fell back to 13th at the finish, moving Keane up to 11th. Seifert started 19th and was the final finisher on the lead lap, in 15th. 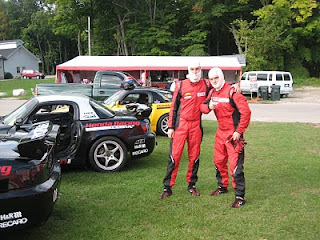 After dominating HP last year, Honda’s received a “rules adjustment” for 2010, and as a result, Steve Sargis took his Triumph Spitfire to an uncontested, dominant 40-second victory over the Honda CRX of Michael Moser, who started and finished second, but couldn’t touch Sargis. Gauper, third in 2009, was fourth this year. Rogerson moved up five places in the race to finish seventh, Burk started 16th and finished 12th; while potential top-five finisher Boylan dropped out after 10 laps. Making its competition debut, the tube-frame, rear-wheel-drive Honda Civic Si started 18th and last after engine problems early in the week prevented Jim Hargrove from posting a qualifying time. However, the car proved to be very quick, and he moved up to a ninth-place finish, despite a mid-race spin. Kristensen also suffered mechanical problems in qualifying, and his team elected not to start, rather focusing their efforts on their several Honda race engine customers (Hargrove in GT-3, GT-5, FP and HP). The largest Production/GT/ST/Touring field of the weekend with 29 starters, but with only one Honda entry (down from 5-6 in recent years). Sturm qualified and finished sixth in a somewhat processional event. The first year for this one-liter, motorcycle-engine class, Tom Beattie was running a new car designed and built by Philly Motorsports, and using a Honda CBR1000 engine. Unfortunately, Beattie spun and made heavy impact in the “Kink” on Lap 9 to end his race. He was not injured in the crash. The one-off Philly Motorsports chassis was very well engineered and constructed, but appeared to be a bit “large” compared to other designs and was not completely competitive. However, further development time could improve the car. Formula F was the third-largest race of the weekend (only Spec Miata and Spec Racer Ford had larger fields). 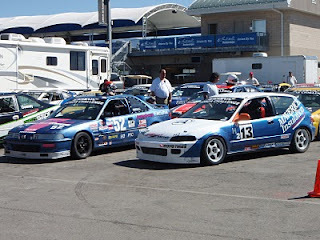 However, Honda entries were handicapped by the 29mm air restrictors currently required by the SCCA. There was a large, multi-car collision at Turn 5 of the opening lap that Scanlan successfully avoided, moving up to 11th in the process. Layton avoided the incident in front, but was hit from behind and spun, ending up with rear suspension damage. After the Lap 4 restart, Scanlan was unable to hold his position due to a lack of straight-line speed, dropping to 14th before recovering to 12th at the finish. Layton restarted in 28th and moved up to 23rd before a last-lap spin in Turn 6 resulted in a 24th-place finish.